Morphylogeny: PRNS 1325 "Brothers in Arms"
#483: PRNS 1325 "Brothers in Arms". Hurricaneger, episodes 10, 21, 23, & 36. The complete program, from opening to end of end credits, lasts roughly 21:28;00. The three Wind Rangers' morphing sequences. Recycled montage from 1304, but cuts final shot. 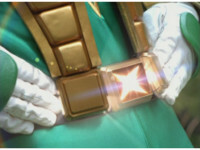 Green Samurai presses his belt, unsnapping his vest as the buckle glows. 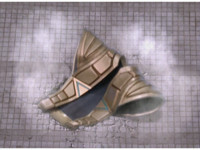 Green Samurai's golden vest falls to the ground, putting a dent in the cement. 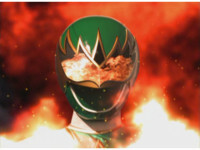 He switches to Super Samurai Mode by spinning his upper helmet portion around, flames igniting around him. Green Samurai unsheathes his Saber and flips over while slashing it. Motodrone charges into battle, beating down Navy a few times, then doing the same to Crimson. Cuts before he can roundhouse Navy down. Navy falls into a fence, then gets up and strikes at Motodrone, who blocks and kicks him into a stack of junk, before turning to attack Crimson. Cuts before he grabs Crimson by the neck and smacks him around, US replaces it with some fighting . Motodrone tosses Crimson into a fence, he recovers quickly and pulls out his Crimson Blaster, firing it at Motodrone to no avail, as the villain walks over to him uninterrupted. Crimson strikes at him, Motodrone blocks, grabs both of his arms and causes him to drop his Blaster. Shot 5 is trimmed to reduce wrist twisting, I guess; cuts follow-up of Motodrone pummeling Crimson up close. Crimson speaks to Motodrone, who responds, then breaks out of their hold and sparkily punches him in the chest a few times. Cuts before Crimson staggers back; cuts follow-ups of Motodrone using scorpion-symboled punch that leaves Crimson floored. Navy staggers over to the defeated Crimson, cradling him in his arms and speaking to him. Shortened to reduce dialogue; cuts follow-ups of Motodrone talking to them, then leaving. Zoom in on Motodrone, sitting on his cycle and revving the engine. Crimson & Navy ride onto the scene with their Tsunami Cycles. All of the shots from 36's cycle battle were originally sunset tinted; cuts follow-ups of Motodrone watching as the Thunders ride up, park, talk, then drive forth again. Motodrone speaks, then revs up and drives forth, as the Thunders speed at him. They fire lasers at him, but miss, bursting around him, until all three pop wheelies and leap up into the air past one another past an explosion. Motodrone then turns around and follows them down a narrow alleyway, as they glance back at him. The Thunders split up, Motodrone following Crimson. Cuts follow-ups of Motodrone leaping up and striking Crimson with his tire, then grinding close behind his bike, tire to tire. Crimson keeps riding and glancing back, as Motodrone follows. Cuts follow-ups of Motodrone blasting Crimson, who stops and fires his Blaster him, then Motodrone sparkily leaps past him. Then a bike battle between Motodrone and Navy. Motodrone leaps his bike up. Motodrone's cycle flies over the camera. Yellow & Blue strike swords at Red, all three blade locked for a moment until they break off and pose. Red lowers his guard and talks to his teammates. Cuts prior team sparring in woods; whole sequence is pushed back from source position; cuts final shot before Red touches head and speaks some more. Yellow and Blue walk over, talking to Red. Second half is altered to fit viewscreen; cuts to reduce dialogue; cuts follow-ups of Motodrone appearing nearby and putting collars on the team. Motodrone scrapes his blade along the cement while riding forth at the Thunders, then lifts it up and energy slashes the pair as he passes, causing them to crash into a wall of junk, smashing into the wall behind it and Crimson falls over. Cuts additional shot of scraping between shots 1 & 2; shortens shot 3; cuts shot of Motodrone driving past between shots 6 & 7; cuts follow-up of Navy falling off cycle. Motodrone pulls up to a stop and sits there in the sunlight. Motodrone sends electricity bolts from his eyes forth. US replaces follow-ups of Thunders getting blown up to move explosion behind them. Zoom in on Motodrone staring. Cuts surrounding shots of Thunders on the ground talking. Zurgane removes his left shoulder sword.